We're halfway through 2017 folks. It seems to have gotten here at an alarming pace. Before you know it we'll be well on our way to prepping for Christmas. But we still have a little time before that happens. This, I believe, is a fantastic opportunity for you to re-visit your goals for 2017 and see how you're doing. If you haven't started work on any of them, now is the time. You still have half a year to achieve it. One of my goals this year has been to post on this site with some amount of regularity. I have made some effort with this, but I have a long way to go. So hopefully, these next six months will have me do better. With that in mind, I'm going to share with you a new blog party that I've been part of for the last couple of months. I've participated before, but haven't posted about it. But today, that changes. It's called First Monday Favorites, hosted by the lovey Sid of Sid's Sea Palm Cooking. The first Monday of every month, a group of us bloggers come together to share our favorite recipe from the previous month. It is a lot of fun and I hope you'll join us. 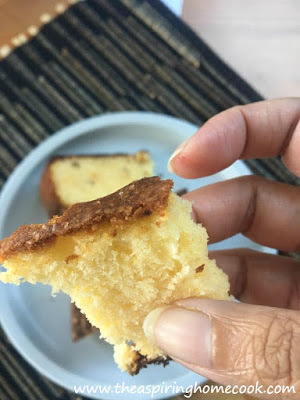 My favorite recipe from June has got to be the Mawa Cake I posted about here. You can check out what the others have shared here. If you have a blog and would like to participate, just get in touch with Sid and she'll send you the details.